As with any business it is important that you buy the correct equipment in order to start producing saleable goods. With an art business the start-up costs are relatively low, but it is still vital that you buy the correct items. It is also imperative that you adopt a regular stock taking routine to prevent you running out if vital supplies. You will need a decent supply of canvas or paper in a variety of sizes. Try to buy them wholesale as this will save you a vast amount of money. If you are brave enough you can buy canvas on a role and stretch and frame it yourself. However, this is not an easy option and should be left to the experienced. Depending on what media you choose to work with you will need a good supply of paints. Buy larger tubes, or pans, of the colours you use most as this will prevent you running out half way through a painting. If you work in more than one genre, be careful to keep them all separate to prevent costly accidents. Carefully label each box with the paint type and only open one type at a time. Clean up left over paint when you have finished working to prevent accidents. Avoid buying student grade paints as they don’t contain the same amount of pigment as artist’s quality paints. These are probably your most important piece of equipment as they are not disposable supplies. A good brush should last you years. Choose one of the best quality you can afford but remember watercolour requires different brushes than oils or acrylics. Choose with care. Tabletop easels are fine for amateur artists painting at the kitchen table, but to produce your best work you need to buy a freestanding easel. Again there are many on the market but unlike paints or canvas you can take the cheaper option. They may not last as long as more expensive easels but when you consider they are going to get covered in paint and oils, they are adequate. If you wish to use an easel to display your work, then the more expensive options with attractive brass finishes are the best choice. Different paints need different cleaning materials. Watercolour and Acrylic can easily be cleaned with water, but oils need to be cleaned away with turpentine. Your brushes will need to be cleaned after every session to remove all traces of old paint otherwise you risk contamination of your painting with old paint. Keep your cleaning material clearly labelled and kept safe to avoid accidents. Keeping all your equipment is different boxes will make them easier to store. It will help to keep your workroom tidy and safe, not to mention making it easier to find what you’re looking for. Make sure each box is labelled so that you know what each one contains. 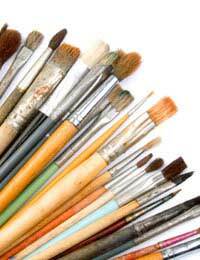 When it comes to your brushes store them in an old jar, bristles pointing up. If you place them bristle down the hairs will bend out of shape making them impossible to use. When you have washed them out, squeeze the hairs back into a point instead of leaving them splayed out. If you’re in any doubt on what to buy visit your local art supplies shop and ask for help. Most will willingly explain the differences in the products to you and help you decide which the best choice is for you. Remember to always buy the best you can afford, cheap items are a false economy. Questionnaire: Your Art or Your Business?